4:3 format has white casing; 16:9 format has black casing. Optional elite remote chief universal learning remote - control all screen, projector, TV, DVD and cable box, etc. Hi. 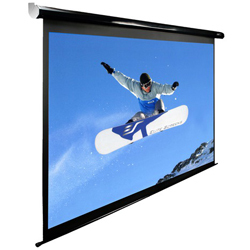 Will this screen work with the projector mounted behind it? If not, can you suggest a similar size motorized screen that would?